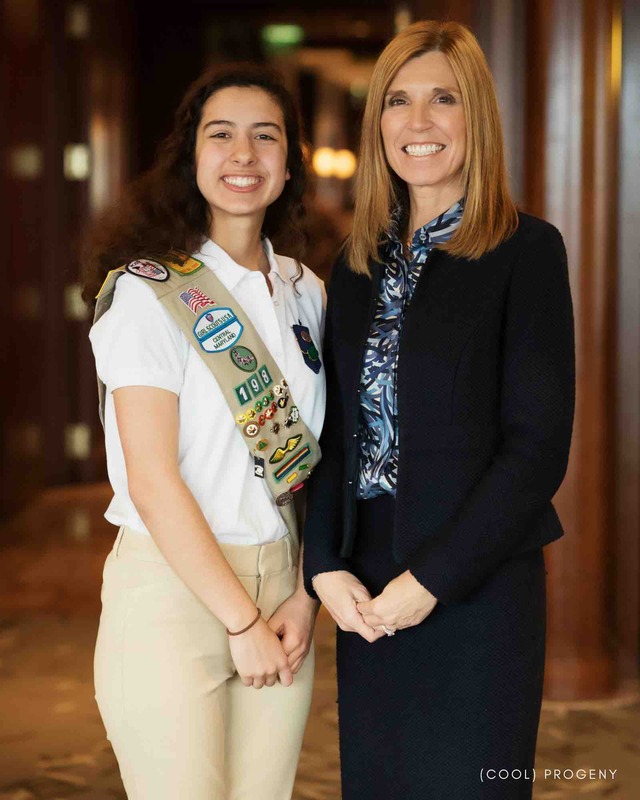 That’s how Stacie Tobin emotionally concluded her advice to the five Maryland Girl Scouts selected as “Shadow Girls” at the 38th Annual Girl Scouts of Central Maryland’s Distinguished Women’s Celebration last month. (And truthfully, everyone was tearing up with pride — not just Ms. Tobin). 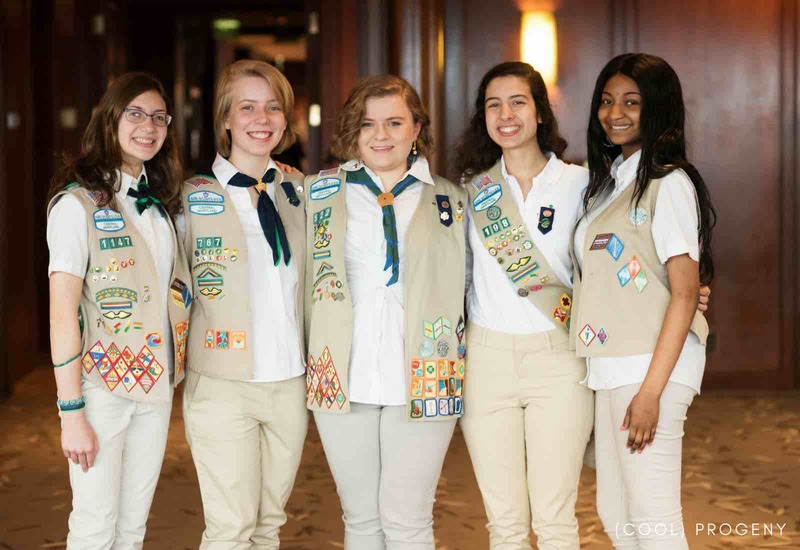 Each year, Girls Scouts of Central Maryland hosts a search to find women in the community that possess characteristics and traits that they are trying to instill in every Girl Scout. 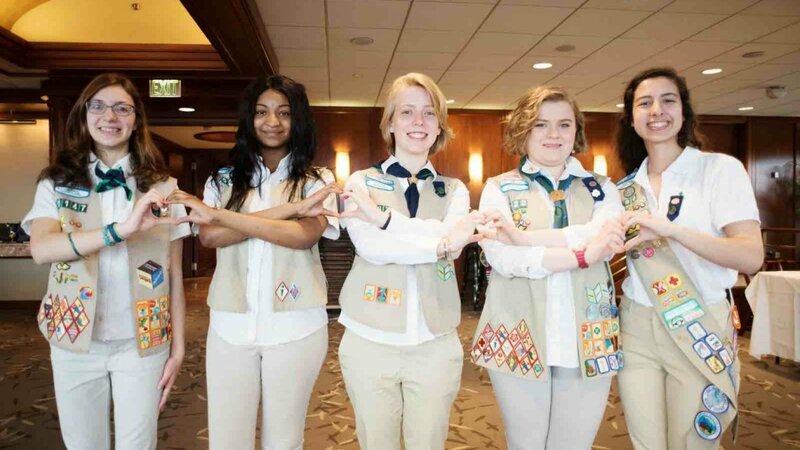 The women selected have an opportunity to see what Girl Scouts offers to girls and how it it is shaping young ladies into future distinguished women. At the same time there is a callout in November to all Senior and Ambassador Girl Scouts who are looking for an opportunity to share a day in the life of a distinguished woman. 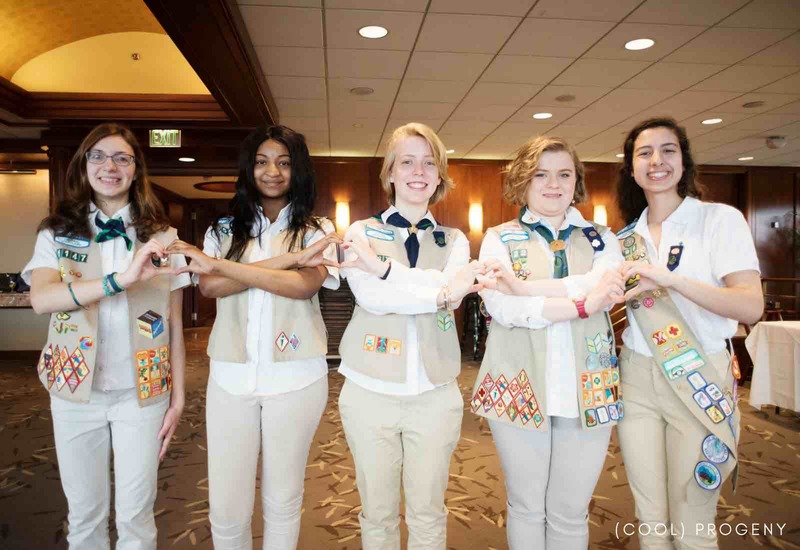 This experience is guaranteed to broaden horizons, provide a window of opportunity, and create lasting relationships for both the distinguished women and the Girl Scouts. 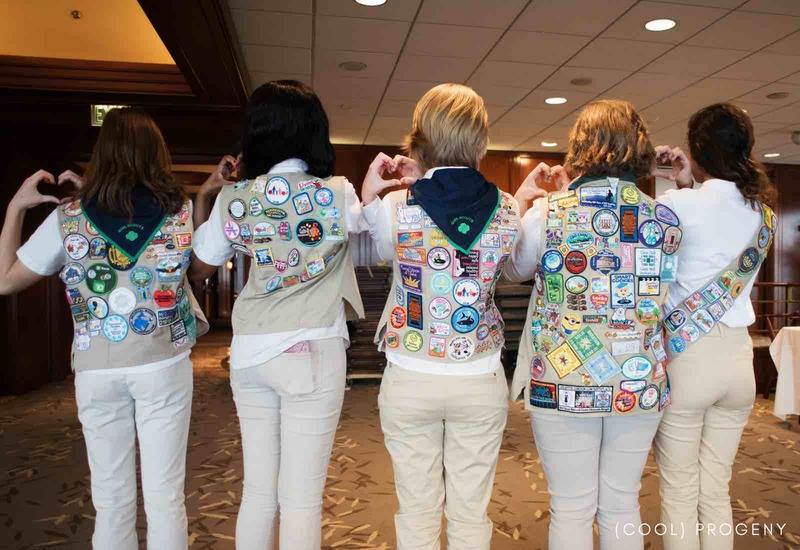 The Awards Ceremony brings everyone together, giving space for both Scouts and distinguished women to address an audience of Girl Scouts supporters. It’s inspiring to hear about the selected successful, respected Baltimore women through the eyes of a young girl scout who shadowed them. This year, hundreds gathered at The Center Club to honor Swata Gandhi, VP and General Counsel of DAP, Kristin Herber, Senior Director and Managing Counsel of Under Armour, Dr. Redonda Miller, President of The Johns Hopkins Hospital, Alicia Ritchie, Principal of Miles & Stockbridge, and Stacie Tobin, Partner at Venable LLP. (cool) progeny had the privilege to speak with a few of the Distinguished Women and their Girl Scout Shadows to learn about their experiences and see how their days really went down. Don’t let the term “shadow girls” fool you — these ladies certainly stepped out into the spotlight! Stacie Tobin is a litigation partner in the Baltimore office of national law firm Venable LLP, who handles business litigation and product liability matters for a range of clients. Ms. Tobin has been recognized as one of The Best Lawyers in America for Commercial Litigation every year since 2013, and last year was selected for inclusion in Best Lawyers Business Edition for Women in Law. Ms. Tobin was shadowed by Abigail Brannon. Abigail has been a Girl Scout for 11 years and is a member of the troop Juliette in Harford County. Ms. Tobin tried really hard to make Abby’s shadow day a day where the two of them could be in court but — as many things do –plans changed and the day ended up being an “office day.” Abby had the opportunity to sit in on staff meetings, listen to opposing counsel meetings, and participate in client meetings. The first impression from her experience? “There may be one leader but everyone must be included to achieve the best results,” said Abby. Even though Ms. Tobin knew Abby wasn’t necessarily interested in pursuing law as her future career, she wanted to make sure she was able to show Abby the leadership challenges and professional challenges that are present in every work environment, not just a legal one. “I hope I was able to teach Abby to be open to learn from colleagues, learn from clients, and just learn as she goes,” said Ms. Tobin. Abby’s key takeaway was learning to keep an open mind about what you can do and want to do. “You may start out trying one thing and realize it’s not what you’re truly passionate about and it’s ok to try something else,” said Abby. Swata Gandhi is the Vice President, General Counsel and Chief Compliance Officer at DAP Products Inc., based in Baltimore. DAP Inc. is the leading manufactures of caulks, sealants, and repair products in the US. With over 20 years of experience, Ms Gandhi has clerked for judges, worked in AMlaw 100 law firms and has been in-house with experience in IP, manufacturing, distribution, and online education. Ms. Gandhi is very passionate about giving back to the community and instilling in all young women the importance of doing so. 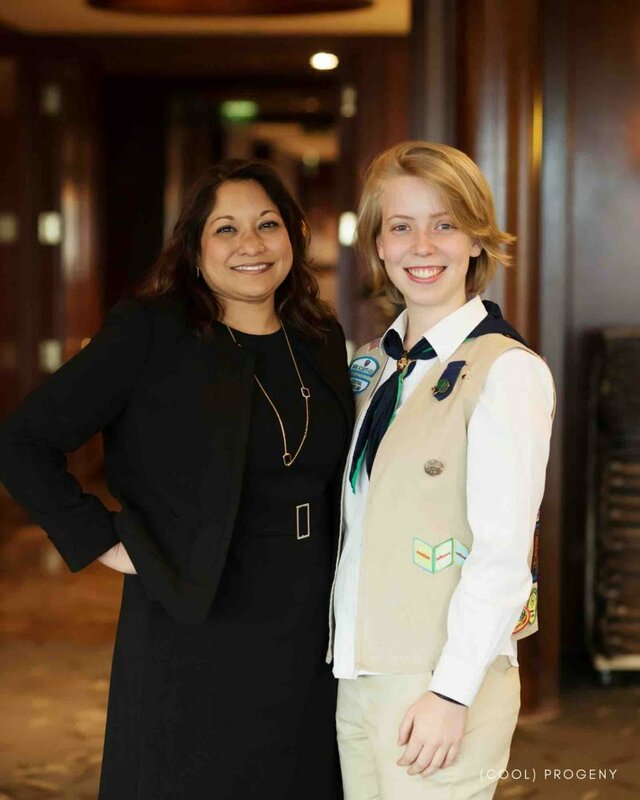 Alexandra Pavao of Troop 767 in Howard County, and a Girl Scout for 12 years, had the honor of shadowing Ms Gandhi. Alex initially was nervous and undecided about trying out for this shadow opportunity because so many talented girls were applying. The minute she got the call back for her interview she knew it was the right decision! With an eager spirit and enthusiastic attitude, Alex stepped into Ms. Gandhi’s world at DAP where interactions with all different departments is a regular occurrence and being a lawyer doesn’t just mean sitting at a desk. Alex jumped right in, learning about patents with the company and customer claims. She even had an opportunity to visit the IT department, which was specially set-up by Ms Gandhi after she learned Alex was interested in pursuing computer science as a degree in college. Throughout the shadow day Ms. Gandhi demonstrated having confidence in yourself, a voice that can be heard, and being proactive which allowed Alex to walk away from the experience feeling empowered to determine her own success and understanding the importance of giving back. 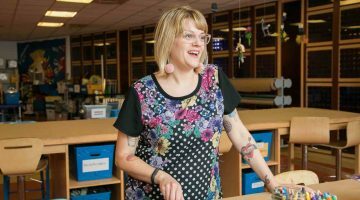 “It was an opportunity where you might surprise yourself and you learn so much more than you ever thought—plus it’s fun!” said Alex. Dr. Redonda Miller is president of The Johns Hopkins Hospital, a 1154- bed teaching hospital with over 10000 employees and approximately $2.4 billion in operating revenue. Dr. Miller arrived at Hopkins in 1988 as a medical student. After finishing her internal medical residency, she joined the medical faculty in 1997. She earned her M.B.A. from Johns Hopkins University in 2004 and since then has served in several roles, most recently VP of Medical Affairs for The Johns Hopkins Hospital (2009-2018) and Senior VP of Medical Affairs for the Johns Hopkins Health System (2016-2017). 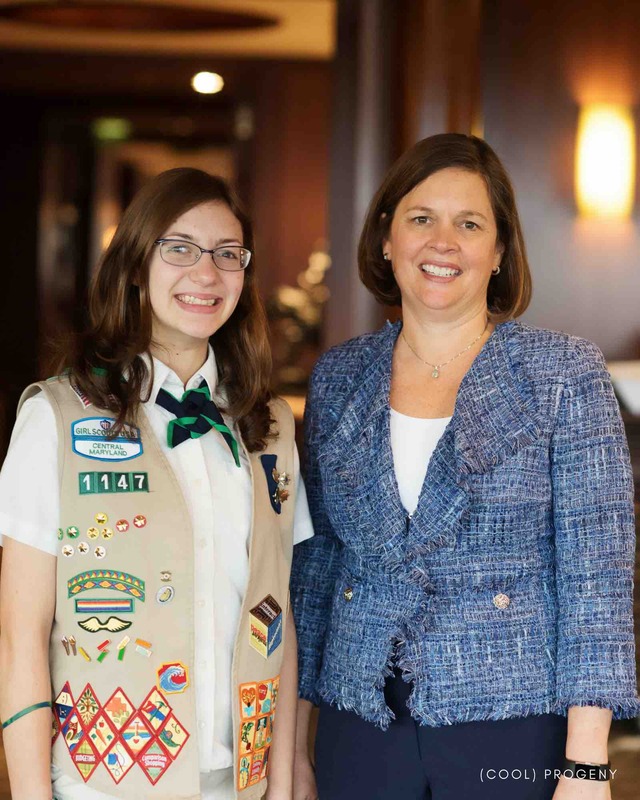 Dr. Miller’s shadow Girl Scout was Athena Sackle of Baltimore County Troop 198. Athena has been a Girl Scout for 12 years and plans to attend college next year. Although she has not decided on the exact school just yet she is possibly looking at going to med school, which made this experience all the more exciting for both ladies. Dr. Miller and Athena were two peas in a pods. Both ladies were super energetic, enthusiastic, and could not wait to tell us how their day went. From touring the hospital and the “backbone” of the hospital, it’s towline, to visiting the biocontainment unit and then watching chemotherapy drugs be made—these ladies still managed to squeeze time in to chat to faculty and staff. For Athena, it was “really cool to see how she [Dr. Miller] knew even the littlest details like the fact that someone switched desks and how Dr Miller made sure to say hello and take time with everyone.” Dr. Miller was so impressed with Athena’s passion, excitement, curiosity, and willingness to make a difference and do something great. Being able to experience aspects of the hospital, like the Simulation Center where Athena was able to participate with current residents on a test for saving a patient’s life, Athena was able to gain more confidence in herself and realize that she really can do anything she wants as long as she puts her mind to it. Editor’s Note: (cool) progeny is a proud media sponsor of the 38th Annual Girl Scouts of Central Maryland’s Distinguished Women’s Celebration. Photos by Laura Black, Laura Black Photography.